Los Angeles to Tokyo in American Airlines economy seat (bulkhead 13H): A long journey in poor conditions. My review of LAX to TYO on American Airlines might sound very critical, but that’s only to those of you who have flown on flight run by American airline companies like AA, United or Delta. If you’ve flown any major international carrier like Japan Airlines or Lufthansa, you’ll notice there’s a level of quality and service that American airline carriers are missing. I initially had a better flight, but sometimes booking with United is a nightmare. As the story normally goes, it all started on a crowded morning in LAX. TSA pre-check doesn’t mean anything if everyone has it. There was very little space in the seat. In the bulkhead area, there isn’t a pocket for your small items so I carried everything in my jacket pockets. We received a very small pillow and thin blanket. I did however have plenty of legroom and a noisy seatmate (crying child). At one point I realized I was very dehydrated and had a headache after not having any fluids on the flight for 6 hours. The flight attendants only offered drink service twice. I needed water but the flight attendants never showed up when I pressed the flight attendant button. I pressed it a lot before giving up. Eventually I just got up to ask the flight attendants in the galley for water. They gave me water but with one heck of an attitude. The harsh news about long-haul economy (12 hour flight time to Japan from LA) is that you do not receive an amenity or a toothbrush. Just a seat on the plane and the hopes of getting off that seat at your destination. When you’re on a plane for 12 hours, you will want to brush your teeth. I had some chicken and rice and it didn’t taste like food. They gave us very low quality plastic utensils . It was a small amount of food that I didn’t want to finish but forced myself to finish to keep my strength up. After serving the food they came by for drink orders. I asked for two cups of water with no ice. I finished the first glass immediately then stacked the cup under the other full water. This was the 2nd meal they served. When they came by to serve the meals, I was sitting in the aisle seat. I took out my tray and asked for the safer sounding option, which was the chicken at the time. They took out the chicken platter and then there was a stalemate. I looked at the flight attendant, then looked at the easily accessible tray already in front of me (I had to set up the table…there was no tablecloth), then glanced back at the attendant holding the tray. He put hesitantly put the tray down on the tiny table. After this 2nd interaction, I realized most people have to take the tray from the attendant’s hands. Not something I plan on learning. The IFE selection was pretty good. Unfortunately they gave me some really uncomfortable earphones. That’s earphones and not headphones. A lot of sound leaked in, they were uncomfortable to wear and they had no bass. Pro-Tip: Bring you’re own headphones! It was very difficult to sleep on my flight. To the right of my seat was a family with 2 kids: one toddler and one baby. The toddler had a lot of energy and kept running around and throwing things. I was hit several times throughout the flight. The baby was a loud crier. I couldn’t enjoy any movie and switched to using my ear plugs instead. Luckily I brought an amenity kit from my last flight and happened to have legit earplugs in it. That wasn’t enough though since the parents laid the baby out in the chair next to me and from time to time he’d just kick me. This was one of the longest flights I’ve ever been on. I could have rode with Japan Airlines 12 hours later but really went for the time savings. 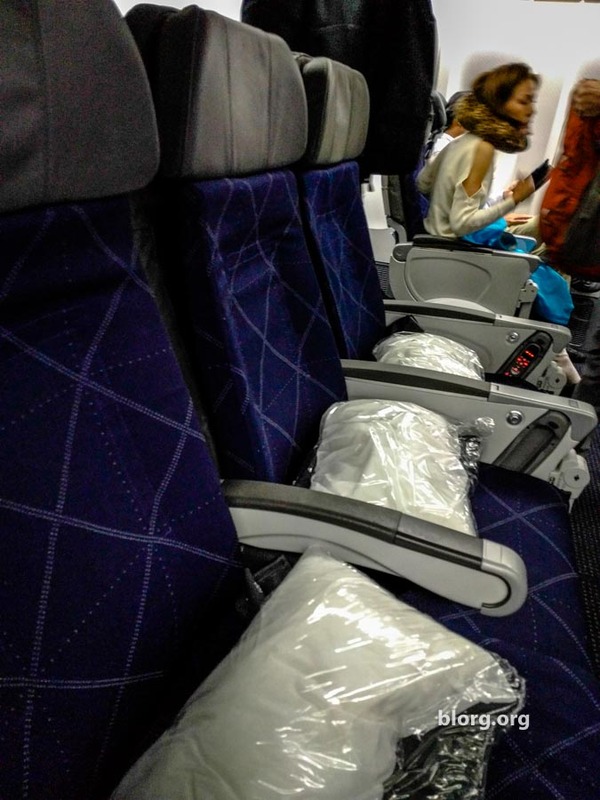 If you’ve ever rode with a Japanese Airline (Japan Airlines or ANA) , you’ll know what a pleasure it is to be in their economy cabin compared to American Airlines. Once you’ve rode on both, you’ll know which is best. Before arriving in Tokyo, you should have already made accommodations. If you haven’t, check out this guide on where to stay in Tokyo. When I travel alone I like to stay in capsule hotels because I’m very frugal. Next, you’ll want to take the airport limousine bus to the city if you have luggage. Because traveling with luggage on the subway will be difficult in Tokyo. The Tokyo public transit system can be intimidating, so check out this guide on How To Get Around Tokyo and the Japan Rail Pass.